Since practically everyone doing a blog here is an Aussie, I thought I'd better start one to try and even things out. I plan to blog about what I'm up to as well as general observations about the table tennis world, ITTF monitoring, videos I find interesting, inside information from confidential informants, and possibly some cartoons, parodies or other fun stuff. This first thing you need to do is click on Subscribe topic as shown below so you are notified about the latest updates. ITTF President Adham Sharara presented gift bags to the dignitaries at the current Peace and Sport Cup in Doha, which included a Special Advisor to the United Nations, the Chairman and Chief Executive Officer of Korean Air (the major sponsor of the event) plus the President of the Qatar Table Tennis Association. Word is that the bags contained a towel, a coffee mug, a T-shirt, a sleeve of three table tennis balls and some coupons. If I am ever reincarnated as a double inverted player, I would want to play like Wilfried Lieck. Here he is in a recent practice game. Who sez the USA isn't a table tennis power? The USA female player Lily Zhang and the Russian player won the Peace and Sport Women’s title and the USA male player Fan Yiyong along with his Russian teammate got to the final before losing to the N/S Korea. All matches in the tournament were doubles. I have ten, that's right 10, Dr. Neubauer Barricade blades. It's my reference blade for all rubber testing. Today I tried a red Yasaka Original 1.0 on the forehand and DF 1615 pips on the backhand. I had never tried Original before, even though I'd had that sheet around here for years (I'd bought it by accident). Anyway, since forum member Kryptos uses it (in 1.0 too) I thought I'd compare it to my Butterfly Tackiness Drive 1.5. Original felt pretty good and had good control but a flatter trajectory, so I was getting less arc on the ball than normal and I was clipping the net on some of my big attack shots. 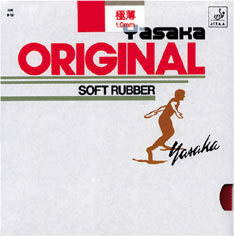 Black 1615 was great as always, but it was just there for emergency use as I was mainly testing Yasaka Original. If I were to switch to it for real, I would need a black sheet and maybe with 1.3 or 1.5 sponge, if I could find anyone who sells those sizes. The only place I know is Iruiru. I'm not looking to switch, but getting Tackiness Drive in 1.5 on this continent is such a pain in the rear thanks to Butterfly's stupid policies, that I'm tired of jumping through hoops and I'm open to new possibilities. Other replacement rubbers on my radar are Giant Dragon Allround and Spinlord Marder. Wouldn't it be fun to have a blade with Yasaka Original on the forehand and Hallmark Original on the backhand? Have you to tried 729 FX 1mm for the forehand? It's a remarkable allround rubber, and it offers tons of control in 1mm. it's also very durable and cheap. That's what I used to use before switching to Tackiness Drive. Wow! At 66 he is still very impressive. Wili Lieck is still playing in 2nd division Bundesliga and playing quite well. I used to swear by the 729 Super FX. I still think it serves better and pushes better than any rubber I've tried. However, for me I've found the Tackiness Drive blocks and drives better (especially when I twiddle to the backhand) and receives serve better. It's very resistant to spin compared to 729 Super FX. For me it also loops better. After being a predominantly backhand player, I've have been working hard on my forehand over the last year or so. During this period I've come to the distinct realization that I'm more of a Euro-style mechanical spin looper than a brush looper. Also for me the feel and control of Tackiness Drive are second to none. The sponge density (Butterfly lists it at 38), weight and speed are perfect. The topsheet has the ideal texture and grip. And for some reason it only works for me in 1.5mm thickness. Many balls that stay on the table with 1.5 go slightly too long with 1.7 and 1.9. I basically tried it on a whim, like I did the Yasaka Original today, and it just clicked. I've never found a forehand rubber that I really and truly liked on the problematically slow Neubauer Barricade until I tried this. He's also the current world champion in his age group. Too bad that style is disappearing from mainstream table tennis. Is he the one in red with the bald head? Fair enough! I've used the Tackiness Drive (and Chop) before as well, although it was a long time ago. I could never get as much spin on my serves as i can with tacky rubbers, and since this has always been an important part of my game, I gave it up.